Opel's new Astra convertible likely will take its styling from the the Opel Paris GTC concept, shown. 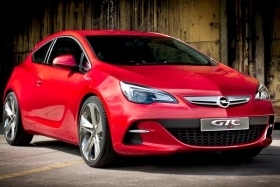 Opel/Vauxhall will build a convertible based on its Astra compact car at its factory in Gliwice, Poland, the company said. The model is part of the General Motors Co. subsidiary's planned 11 billion euro investments to renew its lineup in the next five years. Opel/Vauxhall CEO Nick Reilly said the convertible will give the brand an important halo effect. "The new convertible will be a great addition to our product lineup," Reilly said in a statement on Friday. The convertible will go on sale in 2013 at the same time as a new minicar for the brand, code-named Junior, that Opel says will be a "chic and stylish small car" to meet a growing demand from people with a young and urban lifestyle. Opel said the convertible's name, pricing and equipment, will be announced later. The company did not say whether the car would have a hardtop or softtop folding roof. The car will compete against models such as the Volkswagen Golf convertible that will debut at the Geneva auto show next week, and the Renault Megane coupe-cabriolet and Peugeot 308 CC. Opel stopped production of the Astra TwinTop hardtop convertible at the end of 2010 when the automaker closed the factory that built the car in Antwerp, Belgium, to reduce overcapacity.